Who: Land of Talk from Montreal. 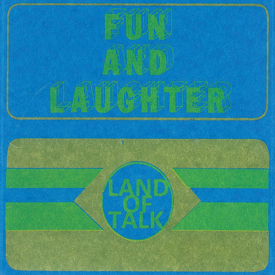 What: A song from the upcoming ‘Fun and Laughter’ EP from Montreal’s Land of Talk. The EP includes 4 new songs, three videos in CD and digital formats, packaged in screen printed art designed by the band. Probably a collectors item for the Land of Talk Fan, head to their homepage or Saddle Creek to find it.